Bill Moyers interviewed Joseph Campbell in a famous series on PBS. I’ve listened to these interviews again and again, and I’ve quoted them many times in this blog. While Campbell’s philosophy was the point of the program, I also got to know a bit about Bill Moyers via these interviews. He’s a religious person, but isn’t afraid to explore his vision of God. I respect that, at least a little. 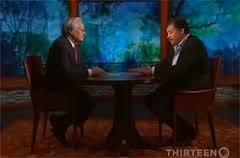 I recently caught Moyers interview with Neil de Grasse Tyson. Tyson does a great job. Frankly, I wish he’d been able to capture some of this improvised energy in his version of Cosmos. Tyson is at his best when he’s teaching – not reading from a script, but actively teaching another human being, as he is here with Moyers. And Tyson is a great teacher. But that’s not what I want to write about here. In the second part of the interview, I think Tyson misses an opportunity. Here’s an idea: We’re not safe. A religion that makes us feel safe is dangerous. The universe is a dangerous place. Worlds collide. Planets are wiped out. Disasters, both natural and human-made, can and do happen. Problems are inevitable. But, as David Deutsch says again and again, problems are soluble. The next disaster is already out there, coming our way, and the only thing between us and that disaster is our knowledge. Not God. Not some cosmic safety net. Not even a security blanket. We, and we alone, can protect us from the very real dangers that are out there. We need more knowledge. We need to understand the universe better, so that we can control it better. Otherwise it will, without a doubt, kill us. It isn’t pleasant. It isn’t uplifting. But it is crucial information. That’s what I wish Tyson had said. I’ve been having a great time reading and watching plays, reading and listening to Yale professor Harold Bloom’s book Shakespeare, the Invention of the Human, and reading Isaac Asimov’s Guide to Shakespeare. Reading Asimov’s chapter on Hamlet last night, I came across the passage in which Hamlet compares Polonius, father of Ophelia, to Jephthah, a character in the Old Testament Book of Judges. How had I missed this story before? If you’ve followed my writing, you know how I feel about the much more famous story of Abraham and Isaac. The story of Jephthah is in many ways even more horrible, and sheds new, horrible light on Abraham. Jephthah goes off to war, promising that if God grants him victory he will sacrifice to God the first thing he sees upon returning home. Any fan of Greek tragedy knows what will happen next; Jephthah indeed is victorious, and who should greet him upon his return but his only child, a daughter who remains unnamed. I’ll call her Pam. 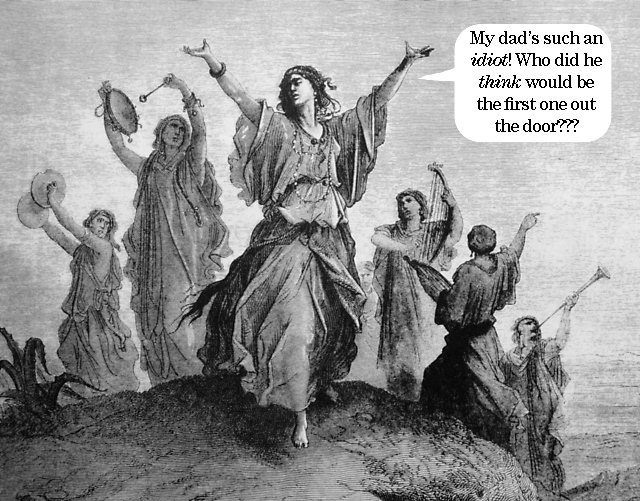 Pam dances out the door to greet her father, but remembering his vow to God Jephthah instantly rips his clothes in agony. Seriously, whom did he expect would greet him at his door? A goat? The neighbor’s kid? Um, OK. I’d be using that two months to find myself a new place to live. But that’s not the O.T. way. Pam returns and Jephthah does what he promised to do. So long Pam. Upon reading this story I instantly went to the apologists’ web sites. Surely there must be some other explanation. Why would God have made such a big deal about outlawing child sacrifice only to have it practiced here? Sure enough, the apologists were on the job. Parsing language and finding double meanings in words (and really means or and so on), they’ve decided that Jephthah didn’t sacrifice Pam. Instead, he simply forced her into a convent for the rest of her life – hence the “mourning her virginity” bit. Well, OK. Though the Jewish interpretation is the straightforward one – Jephthah killed his daughter – and the Christian interpretation was the same for over a thousand years, sometime in the Middle Ages someone decided to start whitewashing the event. OK, fine. I’ll give it to you. If you really, really insist, Jephthah didn’t kill his daughter. Instead, he forced her to give up any sort of life she might have wanted. Later in the chapter, it is stated that the women of the area mourn for Pam’s lost liberty four times a year. That doesn’t sound like someone who lived a happy, well-adjusted life. What’s lost in the whitewashing of this story is that even the sanitized, sacrifice-free version is a terrible, terrible story of someone who, through no fault of her own, had her life destroyed by someone who was supposed to love and protect her. Way to go, God. Once again, we see two contrasting views of life. In one, we are free agents. We make our own choices. We find our own truth. In another, we’re playthings of a capricious and bloodthirsty deity who cares more for rules and regulations than individuals. The story is one of obedience over free expression. Isn’t Pam wonderful to give up all Earthly pleasures just for the sake of fulfilling her father’s poorly thought-out vow? Isn’t it great of Jephthah, who later would be celebrated as a man of integrity, to live up to his promise to God, no matter the cost to anyone else? In the same way that Abraham passed his God test by proving his own spinelessness, Jephthah passed by demonstrating that nothing and no one matters in the face of a meaningless promise to an invisible sky-daddy. We humans can do better than this. Shakespeare, of course, turned the story on its head, showing Ophelia utterly destroyed by the three men in her life who mattered to her – her father Polonius, her brother Laertes, and of course Hamlet himself. While in the O.T. the story is some sort of triumph of servile obedience, in Hamlet the story is the saddest of tragedies, in which the only decent character in the play is reduced to a lifeless corpse over which a dumber-than-rocks brother and a self-absorbed ex-lover can shout at one another. 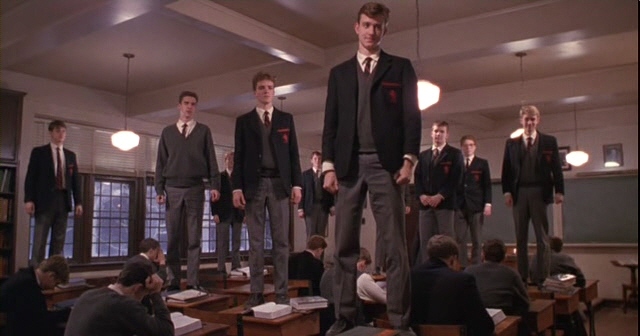 I was in college when I first saw Robin Williams’ Dead Poets’ Society. I was struggling with my future. Did I really want to become a teacher? Why would someone who so hated high school willingly return – not just for four years, but for life? What was a teacher, anyway? John Keating awoke something deep inside me. “When you read don’t just consider what the author thinks. Consider what you think.” I knew immediately what kind of a teacher I wanted to be. Later I discovered John Dewey. Lev Vygotsky. Jean Piaget. Teaching would never again be about the passive transmission of knowledge. 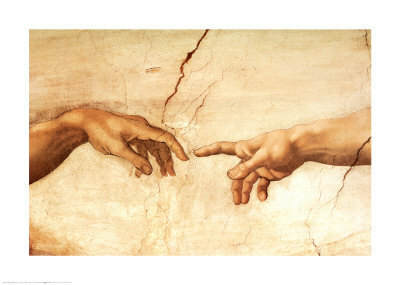 Teaching would forever after be about creation, discovery, significance. It wouldn’t always be easy. It wouldn’t often fit into the standard curriculum. But it would be what mattered. It would be what they would remember. Not filling a bucket, but lighting a candle. Inspiration – the power that comes not from following an algorithm, but instead finding your own way, making your own discoveries, coming to your own understanding. Building castles in your mind. We lost Robin Williams today. John Keating was not Robin Williams. He was a character in a movie. But he made a difference to me. I will miss him. Now that I no longer work at COSI, I suppose there’s nothing stopping me making this story public. For as long as I can remember, the wearing and displaying of crucifixes has bothered me. Whatever your feelings about the historicity of religions, make no mistake: crucifixion was real, as was a horrible method of not just killing someone but delivering a tortuous, humiliating public death (and is the origin of our word excruciating). I always wondered what people would think if some group began wearing electric chairs or guillotines as ornament. In the mid-90’s, in perhaps my second year as the first floor volunteer coordinator at COSI, I convinced the powers-that-be that we needed an area-specific award for volunteers who had gone above and beyond the call of duty. I suggested calling it the Hypatia award, explaining only that Hypatia had been a female scientist who had given her life to science. The PCness of an award named for a woman was irresistible, and the Hypatia Award was born. Of course, those of you who know the story of Hypatia know what i left out. Whether the details of Hypatia’s story are historically accurate, and there is controversy about that, it is certainly a lovely story, and Sagan told it with a passion and intensity that burned into my 12-year-old brain. A decade and a half later, I still remembered the story. 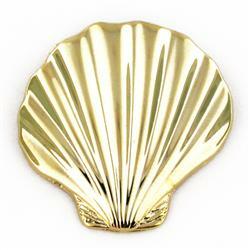 I was allowed to select the symbol for the Hypatia Award, and I of course chose a seashell, the symbol of Hypatia’s martyrdom at the hands of Saint Cyril’s murderous mob. The funny thing was, the Hypatia Award became wildly popular with COSI volunteers. They prized it, and worked hard to impress me and the rest of the team in order to earn it. The recipients wore their seashells proudly on their hour ribbons. Eventually, the other areas at COSI adopted similar awards for their volunteers. It always gave me great pleasure (yes, I admit it) to see volunteers, some of them homeschoolers from rather fundamentalist religious backgrounds, proudly sporting this symbol of Hypatia’s martyrdom. Of course I generally kept this part of the story to myself. Until now. I know, I know, I’m a terrible person, tricking people into wearing a pagan crucifix. I feel bad about it every day.